Just when you thought you had seen it all along comes a guy riding a dirt bike on water. And not only that but he’s surfing it down one of the world’s biggest waves at Teahupo’o Tahiti. Can the world get any stranger? 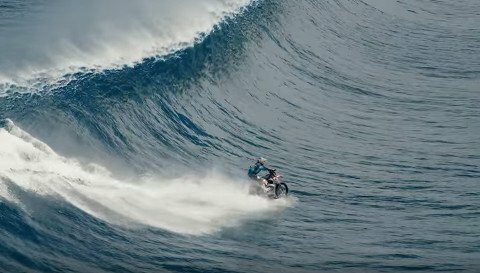 Motocross racer and dirt bike stunt rider Robbie Maddison has pulled off a stunt that would seemingly be impossible. In a video produced in collaboration with DC Shoes, Maddison or Maddo as he’s known, can be seen tearing across the water like a phantom. Reaching the break he makes a broad turn toward the wave and gets out in front of it as the giant comes crashing down. Maddo’s stunt comes down to some technological innovation that makes this amphibious dirt bike possible. In an interview with Rolling Stone, he said the idea came to him a couple years ago. By attaching a custom ski a few inches from the ground along with a small skag and a paddle tire in the rear, he discovered it really was possible to ride the dirt bike over water. After a few test runs in Mission Bay, Maddison found backing from DC Shoes to pursue a more refined version. Original prototypes would ride along great for a short while and then the front end would sink. Every time he sank a bike required extensive work to get it running again. As time went on they found a design that allowed the bike to plain continuously. Taking it to the world’s biggest surf break, now that took guts. But it was a natural fit for the 34-year-old Australian-born dirt biker who was winning surf contests in his youth. “I’ve grown up surfing my whole life. If I didn’t end up in professional moto, I would be a professional surfer,” he tells Rolling Stone. Admittedly, Maddo says he was shaking in his boots a little in the face of that wave. But fear and adrenaline is nothing new for a man who jumped to the top of the 10-story Arc to Triomphe in France and jumped over the Corinth Canal in Nevada. In the last shot from the video at Teahupo’o, Madison can be seen getting overtaken by a wave. What followed, he tells Rolling Stone, was the most violent ride of his life. There I was on a motorcycle, with the worst thing that could possibly happen. I turned out from the wave and it crashed down behind me, chasing me down. I was picked up and thrown, and my bike landed on my back, knocking all the air out of me. It was the most violent ride I’ve ever been on, tumbling beneath the surface in full gear. Over the next four or five minutes, I only had two split-second moments when my head broke the surface and I could take in a fast breath, only to be yanked back down and tumbled with my bike. Everything was going white. I became completely limp and was prepared to take in a full breath of water, when I finally popped up. I could see the helicopter and Jet Skis, and had a quick moment to wave my arm so that they could locate me.